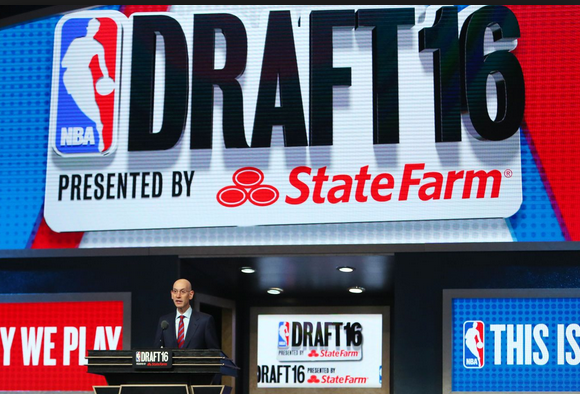 UNLV failed to produce any first round picks in Thursday night’s 2016 NBA Draft as some had projected. But the Runnin’ Rebels more than made up for it in the second round. Sophomore guard Patrick McCaw was selected by the Milwaukee Bucks with the eighth pick of Round 2 (No. 38 overall) and was then quickly dealt to the Golden State Warriors. Three picks later, 7-foot freshman forward Stephen Zimmerman Jr. went to the Orlando Magic. It marked the first time since 1991 that UNLV had two players taken in the same NBA draft. That year the Runnin’ Rebels had three of the top 12 picks including overall No. 1 Larry Johnson by Charlotte as well as forward Stacey Augmon (No. 9, Atlanta) and point guard Greg Anthony (No. 12, New York). Golden State paid $2.4 million to Milwaukee for the pick to take McCaw. General Manager Bob Myers said he expects the 6-foot-7 wing, a second team all-Mountain West pick who averaged 14.7 points and had 81 steals last season, to make the roster on a Warriors’ team that set an NBA record with 73 regular season victories and eventually lost in seven games in the NBA finals to LeBron James and the Cleveland Cavaliers. “Yeah, that’s the expectation, sure,” Myers said of McCaw. “We bought the pick; you’re not wrong. We expect him to be on the team, we expect him to sign a contract with us and I think that’s what we’ll end up doing. Three picks later Zimmerman was picked by an Orlando team that made headlines earlier Thursday night when it traded star guard Victor Oladipo along with the No. 11 pick of the draft (Gonzaga forward Domantis Sabonis) to Oklahoma City for shot-swatting power forward Serge Ibaka. “We’re really intrigued by Stephen and his game and his personality,” Magic GM Rob Hennigan said. “He’s a real mobile center (that) can run, can rebound, can shoot, can pass. I suppose that’s a good start. The Philadelphia 76ers, owners of the NBA’s worst record this past season, won the NBA Draft Lottery in May and used the No. 1 pick to select Ben Simmons. The Los Angeles Lakers chose Duke University forward Brandon Ingram with the second selection. Boston, which came into the NBA with an all-time record of eight picks, chose Cal forward Jaylen Brown with the No. 3 selection. Dragan Bender (Phoenix), Kris Dunn (Minnesota), Buddy Hield (New Orleans), Jamal Murray (Denver), Marquese Chriss (Sacramento, traded to Phoenix), Jakob Poeltl (Toronto) and Thon Maker (Milwaukee) were the other players selected in the Top 10.